Thank you Matt. Working with Dwelling Renovations has been a pleasure. MIchaela, thank you for the positive feedback. I really appreciate it. Thank you Deeann, I look forward to working with you again soon. Justin, thank you very much for the review. I take it as a great compliment coming from someone as truly talented as you are. My work as benefitted for your efforts many times. Karl is very professional, with lots of good ideas. He is easy to work with, accommodating, ad accurate in his assessment of timeline. Elektra Lights and Fans Inc.
Karl is a fantastic builder and designer. He is always current with the cutting edge styles. 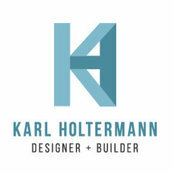 We've had the pleasure of working with Karl for several years.